Something a little different, but worth the extra effort. These beef skewers are great on the barbecue. Place all ingredients except the beef into a large bowl, and stir to combine. Pour half of the marinade into a second, smaller bowl, and reserve on the side for serving. Add the steak to the larger bowl, stirring the beef through the marinade to ensure it is fully coated. Place the marinating steak into the refrigerator and let sit overnight if possible. When you’re ready to start cooking, preheat the barbecue or griddle pan to its highest temperature. 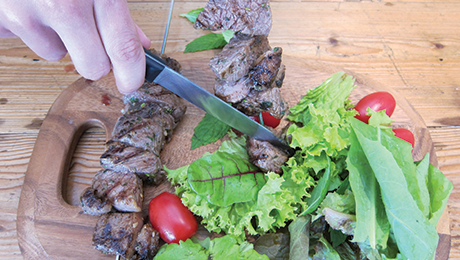 Remove the steak from its marinade and thread onto metal skewers. Cook for two minutes on one side and 1½ minutes on the other (check to make sure meat is done to your likeness before taking it off the grill - you may need to cook it a couple of minutes longer). Let the meat rest for a few minutes before serving, topped with extra marinade.